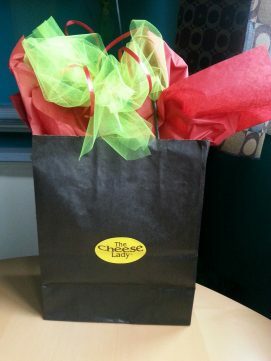 Cheese lady gift baskets allow you to pick your own cheeses or we can pick for you. Our favorites are Irish cheddar, Prima Donna and Manchego. Call ahead and we will have your baskets ready for pick-up, or come on in and you can customize your cheese and items to put in the basket. Now offering online ordering, choose and order a basket online here. Three Cheeses 1/3 lb. each. Crackers, dried fruit in a paper gift bag or box. Four Cheeses 1/3 lb. each. 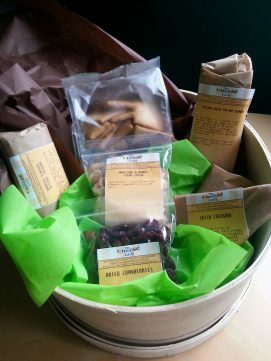 Crackers, dried fruit, Marcona Almonds in a wooden Cheese Lady box. 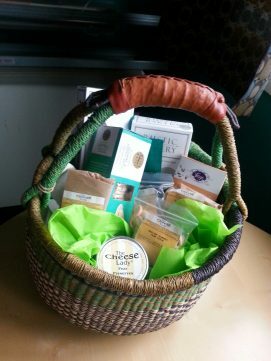 Four cheeses in a medium Bolga basket, with 2 packages of crackers, dried fruit, jam, Marcona almonds, and cookies. A party in a basket! The perfect gift.